Brano Meres' C-Thru frame and bicycle, one which he displayed at the NAHBS 2008 earlier this year, is not to be mistakenly confused with an isotruss frame as some of you may. The geometries are quite different. While one has a well defined open lattice structure, this one just has "holes". For more pictures, visit Brano's website link here. Brano is a mechanical engineer and when I caught up with him last week to ask him what his plans are with this bike, he did mention that "I just wanted to use and test this framed structure for the bicycle. I built just this one frame and I don't want to build another one." For a fun show bike project, I have to say that it looks really marvelous. 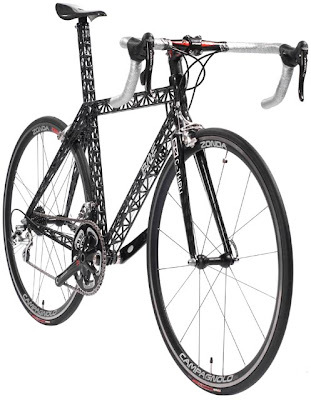 By now ofcourse, you should have known that the isotruss bike (famously the Arantix Delta 7) although very creative and original, has come under overwhelming criticism from critics and riders all over. Personally, when I look at this frame, I first ask the question : "What great need is it satisfying?" Like many people with whom I have exchanged comments, I feel that it is a misapplication of engineering, the costs are over the edge and the aerodynamics and aesthetics are way down there. Even if they do plan on covering this frame up with a sheath, it may, as one engineer told me, lead to the development of inefficient 'eddies' that will probably just double the problems. Everything that can be done on bicycles in terms of raising stiffness and strength by appreciable quantities has already been done. The other marginal differences are just a way to make you pay more out of your pocket. Out-of-limits stiffness, like I say, is actually counter effective and contributes nothing to performance. To be a believer, watch videos of Johan Museeuw destroying his competition on relatively "flexible" Colnago steel bikes, including some at the cobbled Paris-Roubaix. Apparently, even steel was stiff enough for him. As far as the C-Thru and aerodynamics are concerned, Brano said : "I plan to compare it with the standard tubed frame in the wind tunnel, just for the interest." To the first comment,you're quick to quote but you missed out the key point. He mentioned "appreciable". If your brain is so developed as to differentiate between .5mm and .3mm of lateral deflection at the bottom bracket, thats extraordinary. Most people can't and that difference hardly means anything serious to the racing cyclist.I think he was trying to put things into perspective here, not shut down any further ideas on bicycle development. Gary Fisher trying to ride in the mountains has nothing to do with the topic at hand, which is stiffness in bicycle frames.